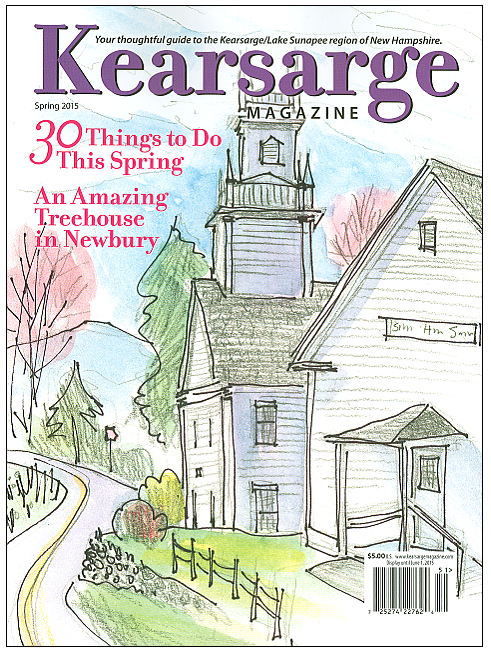 The rough sawn wooden building in Newbury, New Hampshire has the words Sweet Maples Sugar House over the door. 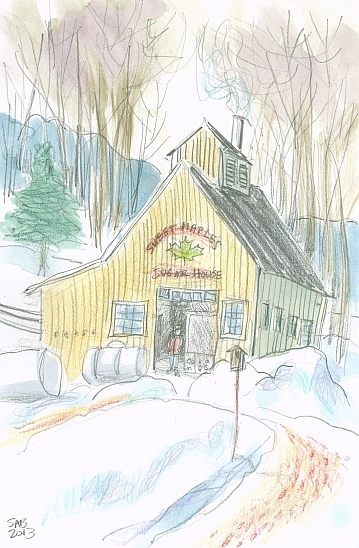 It was Maple Weekend in NH and nearby states. The season for boiling down the collected maple sap doesn’t last long, about 6 weeks. It coincides with mud season...see the footprints in the soft and oozy dirt? The sign along the road calls it Ben’s Sugar Shack. And Ben was there to greet us at the door. He welcomed us in with Maple Sugar Cotton Candy. (Other places call it Candy Floss.) And then there were the other maple goodies to sample and buy...like cakes and fudge and even cheesecake. Yum. Notice the three tubes on the left coming down off the hill and straight into the tanks inside. That is the sap from the sugar bush (forests of maple trees) up the hill and flowing sweetly downward Tree sap is naturally 2% to 4% sugar, and it is boiled down to 67% sugar to become syrup. Forty gallons of sap becomes one gallon of syrup. A gigantic stainless steel vat sits just inside the door, boiling down the sap into syrup. Some of the equipment that controls the process is off to the left. This is made in Canada by the Lapierre Equipment Company. This is my family name, and I am proud to see this name there. My branch of the family came down from Quebec to New Hampshire to work in the quarries at about 1900. Here we have the artist’s point of view, literally. My morning coffee, my morning cross word puzzle, and our view of the ridge. We are looking northeast, but in the afternoons we watch the sun shining on this treed hillside. Fabulous colors and moving shapes entertain us. We really miss the ridge when the leaves reappear in the spring, blocking the view. Groton, NH, population under 600, is a hilly, rural place. When a signpost beside this house came into view, we stopped the car to read and investigate. This simple, yellow painted, wooden house is one of the many homes in New England of writer and religious leader Mary Baker Eddy. Walking around the area, I found the rusty remains of an old mill. I didn’t find any poison ivy, but I was on the lookout for it. To avoid it, of course. Ossipee is one of the twelve Algonquin Indian Tribes. Some of the towns in NH are named for the Native Americans who lived in these parts. 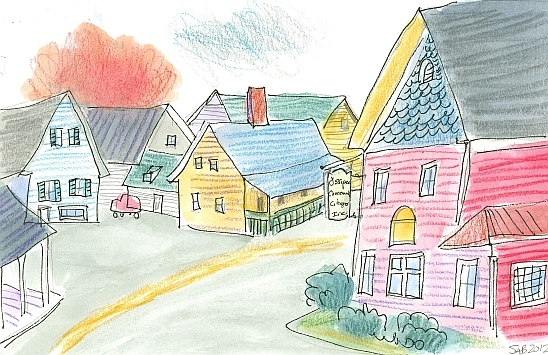 Several villages make up the town, and I was attracted to the arrangement of these colorful wooden houses in Center Ossipee. They were all built probably around 1880, when the railroad came to town. The railroad brought summer visitors to the lakes and mountains. Tourism is still a big industry. The Ossipee Mountains are a nearby mountain range, part of a string of ring dikes. These are the circular remains of long gone volcanoes. If you look on a topographical map you can see them. They look like round, popped bubbles. 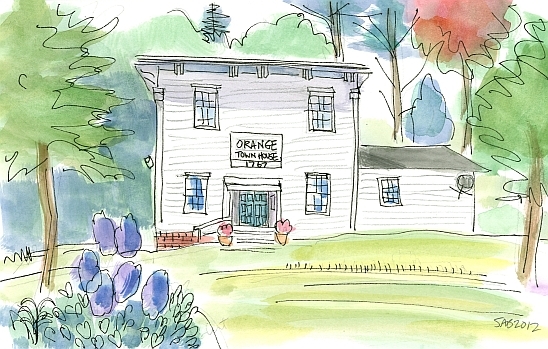 Orange, NH is a quiet rural place. The town, population under 350, used to be called Cardigan after George Brudenell, fourth Earl of Cardigan. Cardigan State Park and Mount Cardigan occupy much of the town’s land. If the Earl of Sandwich invented sandwiches, did the Earl of Cardigan create the first front-buttoning sweater? (Or jumper if you are British.) It is still formally referred to as a cardigan here in the US. The purity and simplicity of the building’s design pleases me. I had to move around a bit as a caretaker was mowing the grass. You can see a tiny strip that he missed. Most towns in NH would call this sort of building a town hall, rather than a town house. Today they both usually mean town offices. 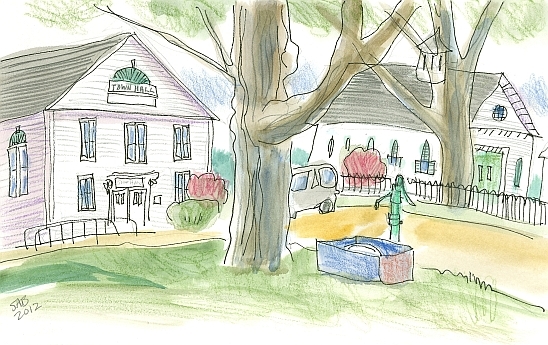 Most of them probably did start out as meeting halls, the venue for the annual Town Meeting which is a form of local governance common here in New England. 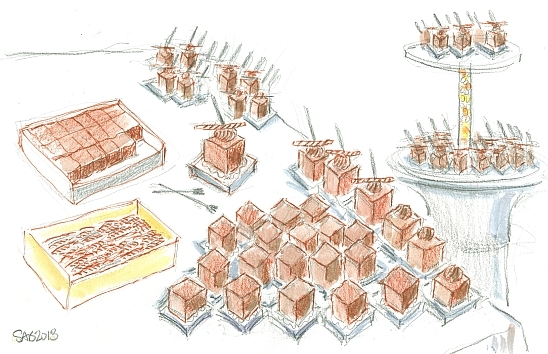 Some towns are so small that the population still fits there, while others have moved on to larger spaces. The town of Piermont is on, or rather next to, the Connecticut River, the border with Vermont. Town historians state that the name Piermont comes from the Italian word for foothill...piemonte. 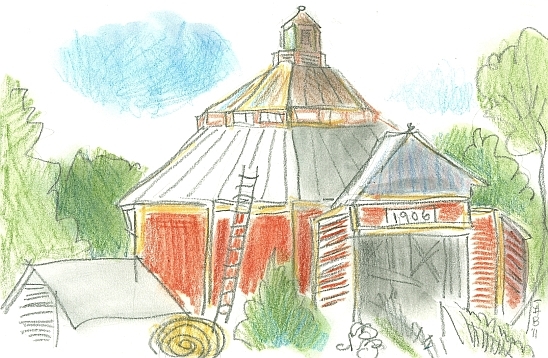 The famed Piermont Round Barn is right next to Route 25, the main road through town. My driver did a quick U-turn so I could pull out paper and pencil. We both knew that this building needed to be drawn. And a satisfying quick sketch is the result. It is actually octagonal as you can see. Round and octagonal barns were considered to be a more efficient use of the farmer’s time. Less walking between cows. But the new mechanization improvements soon eliminated this efficiency and the design popularity faded. This drawing of Chesterfield has been resting in my unexhibited collection of NH towns for two years. It is well overdue to put it here on the blog. 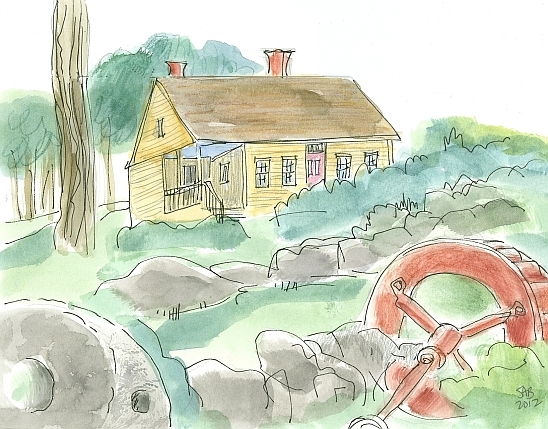 I recall Chesterfield as a stone village, or as the only stone village of New Hampshire. The stone, a warm yellow-grey granite, was quarried locally. The building above is the post office. A friendly and informative woman in the library (beautiful stone) told me that the stone buildings replaced wooden ones that had burned. Vermont, meaning green mountains, usually looks blue to me. These mountains show themselves in the far distance. South Hampton, NH on the state border with Massachusetts, has a land area of 8 square miles and under a thousand inhabitants. And it is near some much more populated towns. A quiet corner it seems to be. On the left stands the clapboarded town hall and grange. The town library attaches to the side on the right, tucked away out of vision. 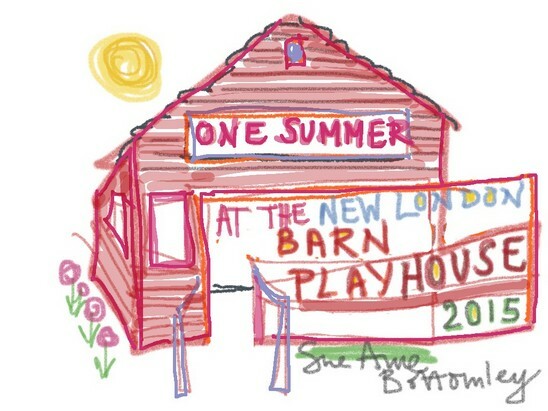 The barn on the far right is larger than usual and more ornate than was customary for the time. Fancy windows, and fancy cupola on the roof. A man near the barn was watching me very carefully. I focus so intently on drawing that I usually forget to toss off a friendly wave. 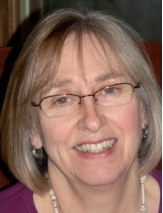 I am an alumna of the class of 1968, with a degree in Fine Art and French. My father graduated from UNH too; I just don’t remember which year. The Second World War closed many departments of the university for several years during the 1940s. The campus was a very vibrant and crowded place after the war, when the professors returned and many students were starting their studies. Or picking up where they had left off years earlier. The University now has 15,000 students, which is twice as many as during my era. But the campus looks pretty much the same to me because the new buildings are all along the edges, with Main Street heading right down the middle. The tower doesn’t actually lean. On this extremely warm day, workmen were ripping up the concrete sidewalk with jackhammers right in front of me as I drew. My concentration may have been compromised. My friend Bev used to play the carillon bells way up in the tower. One time she invited me to go up with her. As I recall, she played a piano type keyboard, and the whole campus was treated to her pop tune selections. Sandwich, NH is a town of 84 square miles and a population of under 1400. That is a lot of trees per person. Center Sandwich is one of the three villages in town. Among a small cluster of white clapboarded houses sits the unusual Samuel H. Wentworth Library. 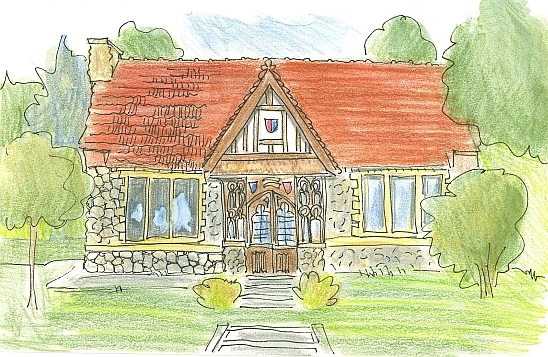 An edifice of a rich selection of materials: red tile roof, grey field stone walls, stained glass windows, and lots of shields and heraldry. Its presentation is very old world, but with a modern wing off to the back. 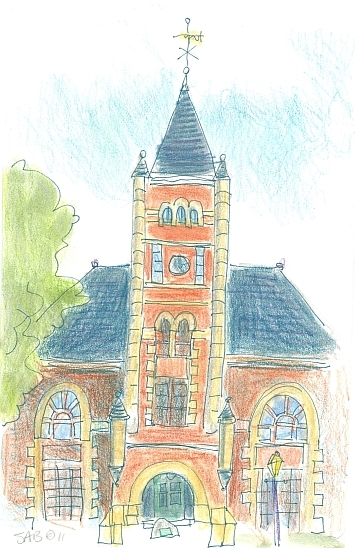 Lovely, old libraries with modern additions, like this one, are quite common here in New Hampshire. The League of New Hampshire Craftsmen began in Sandwich in 1920, and was called at that time Sandwich Home Industries. Is this an unusual looking building, or what? 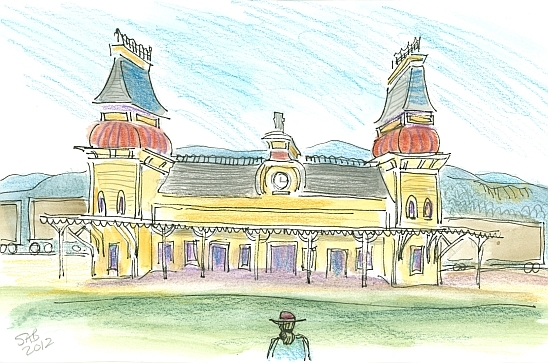 It is the North Conway, NH railroad station, built in 1874. 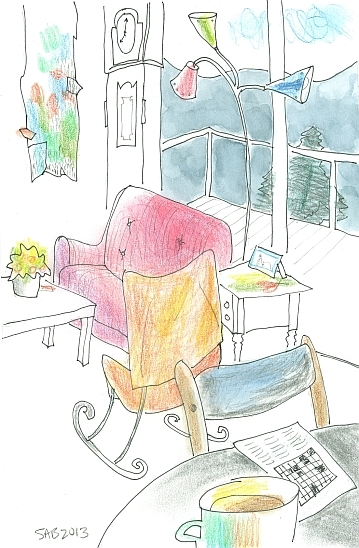 I drew myself sketching in the foreground, really just to add some compositional balance. The White Mountains, blue in the summer, peek behind it. This station would have been the destination for families from Boston, New York, and other big East Coast cities, arriving to spend the summer (‘to summer’) at one of the many Grand Hotels of the era. So it too was grand. There was plenty of room for the hotels’ carriages to pull up under the awning in front for the final leg of the journey. Today the Conway Scenic Railroad operates on two historic rail lines during the summer season. Conway, the gateway to the White Mountain region, is still a very bustling resort area. Hudson, NH is across the Merrimack River from the major city of Nashua, and also on the border with Massachusetts. 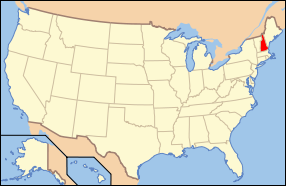 By New Hampshire standards, it is quite a large place with nearly 25,000 inhabitants. When I was a child our family drove to Hudson once a year to spend the day at Benson’s Wild Animal Farm. 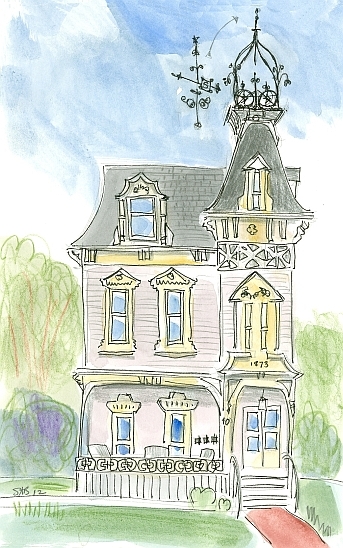 I usually don’t draw private homes (unless requested), but I just couldn’t help myself when I glanced at this Victorian one. The three mailboxes next to the door indicate that this former one family home now has been divided into three apartments. Like everything else, architecture goes in cycles. Tall homes are all back in style. As is towering food in chic restaurants. Vertical is in. The Nottingham Community Church in Nottingham, NH was built in 1875. The wooden building features a number of Victorian architectural flourishes, and gingerbread charm. The smaller the village, the more likely a local carpenter designed the building from pattern books and ideas of what was popular in the big cities, and bought much of the trim from the many catalogs of the day. 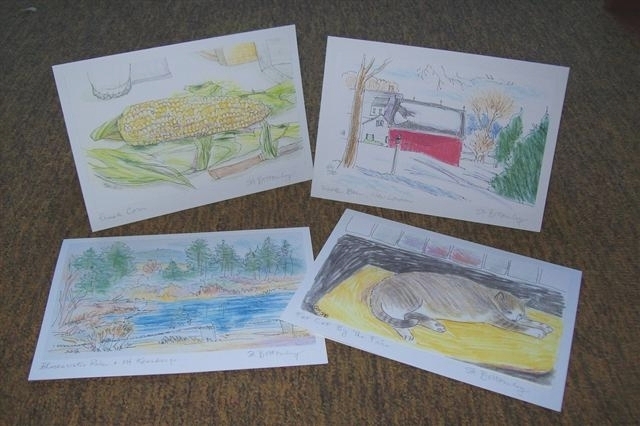 Not an historian or architect, I am a mere artist who enjoys looking, seeing, and recording. 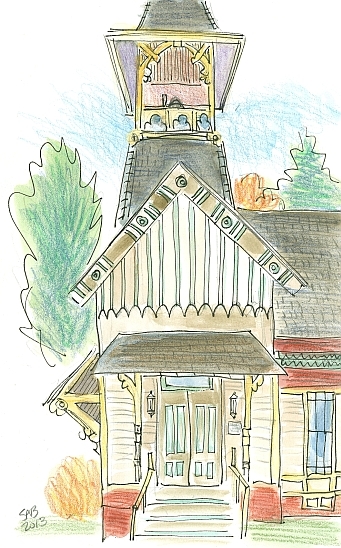 I noted decorative shingles, applied millwork in detailed patterns, and exposed wooden bracing of the roofs. And I did my best to record it on a cold day when I had forgotten my gloves. My online research tells me that Shelburne, NH was named for William Petty Fitzmaurice, Earl of Shelburne. He is remembered for advising King George III to recognize the new country of America. 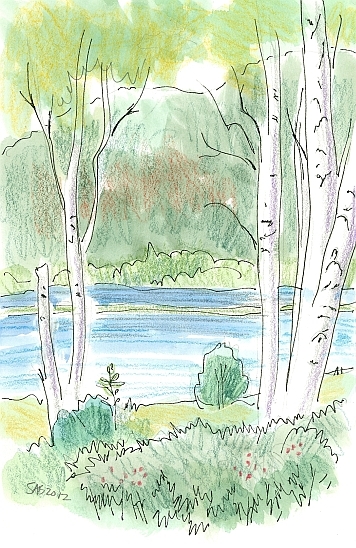 An amazingly lovely grove of paper white birch trees lines the banks of the Androscoggin River. 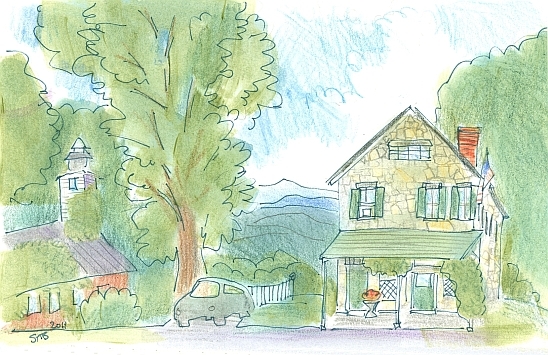 Stopping the car on Main Street of New London, NH, I drew the view over the fields to Mount Sunapee. On March 12, the snow is only knee deep...therefore spring must surely be arriving soon. The spring skiing on the trails is better than average I hear, due to our recent snowy February. 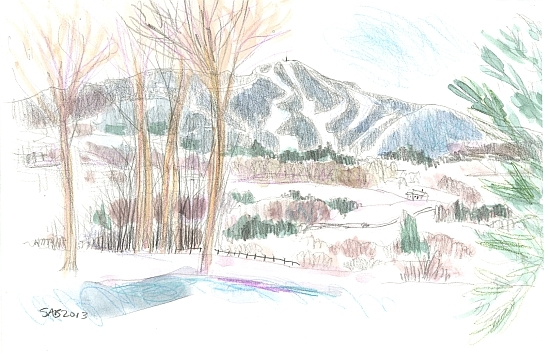 I really do enjoy winter sketching because you can see through the trees, as well as understand the topography. I call it winter x-ray vision. Yes, there is a fence, a road, a car and a few houses. Our woodlands here in New England are naturally mixed forests, that is both evergreens and deciduous trees. Last Sunday, we joined the throngs (550 attendees, a record!) at the Lake Sunapee Region Chamber of Commerce’s 18th annual Chocolate Challenge. Eleven area caterers competed for honors, each with a delicious confection. It was lunch for both of us. We both voted for the dark cake produced by Bistro Nouveau in Grantham. The presentation was impressive as well as the delicious taste. I decided to draw the whole precise assembly line process as they were putting it all together. Think dark fudgey cake, perhaps flourless, topped with a ganache rosette. Horizontally balanced was the dark and white chocolate curl. And a perfect little black fork, stuck in at just the correct angle. Yum. They won the People’s Choice Award. 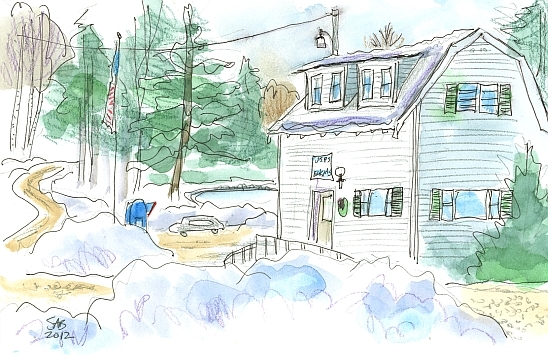 The Elkins, NH, Post Office is where we pick up our mail. This building used to be a restaurant, and hungry summer visitors lined up at the side windows for ice cream cones. The snow piles are deep this March, but the roads and parking lots are bare except for all the winter-accumulated brown sand. Some of the sand will just blow away, but most will be vacuumed up by street sweeping trucks in a couple of months. The south east end of Pleasant Lake is in the background behind the parked car. By June, the lifeguards will be in place, the little lot crowded, and the small town beach full of swimmers. 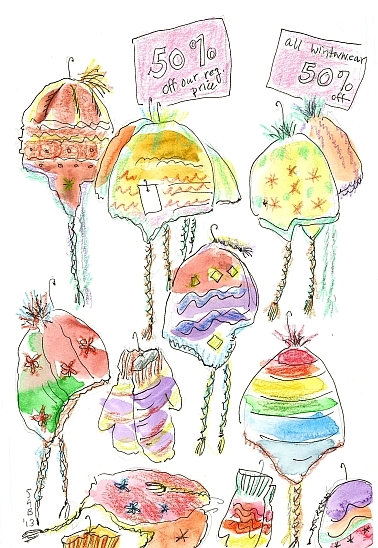 Ooh, it was fun drawing these Sherpa-style woolen winter hats and gloves. I just stood there drawing with my small paper and Bic pencil at our town's Colonial Pharmacy, a sort of miniature department store in New London, NH. The tags and hooks are still attached to them as they await owners All of these extremely warm and beautiful hat/mitten sets are made in Nepal. A sale of winter clothing is really the first sign of spring here in our little, snowy town. 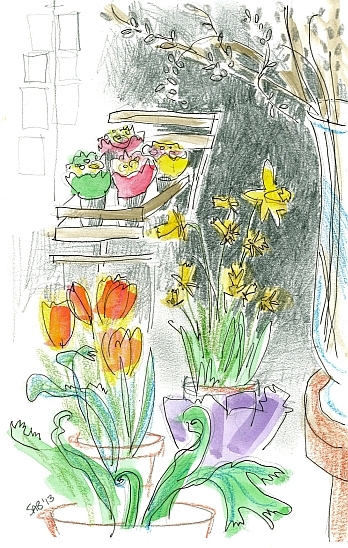 In our wintery, hilltop town, the only places the see (and sniff) flowers this week are the grocery store and the florist. These spring plants are at the entrance to the Allioops flower shop.